Klyuchevskaya Sopka, the largest volcano on the Russian peninsula of Kamchatka, and Shiveluch, a neighboring volcano, are becoming active again. According to news reports, Klyuchevskaya is sending ash to a height of 50 meters, though the plume is barely visible in the lower left corner of the image. The 15,863-foot tall volcano is the region’s most active. Its most recent eruption ended in January of 2003. Shiveluch, above Klyuchevskaya on the right, erupted on January 11, 2004, sending volcanic ash to a height of 1.5 kilometers, and rock and melted snow down the mountainside. At a height of 10,771 feet, Shiveluch is one of the region’s largest and most active volcanoes. Its last eruption, which lasted for two years, ended late last year. 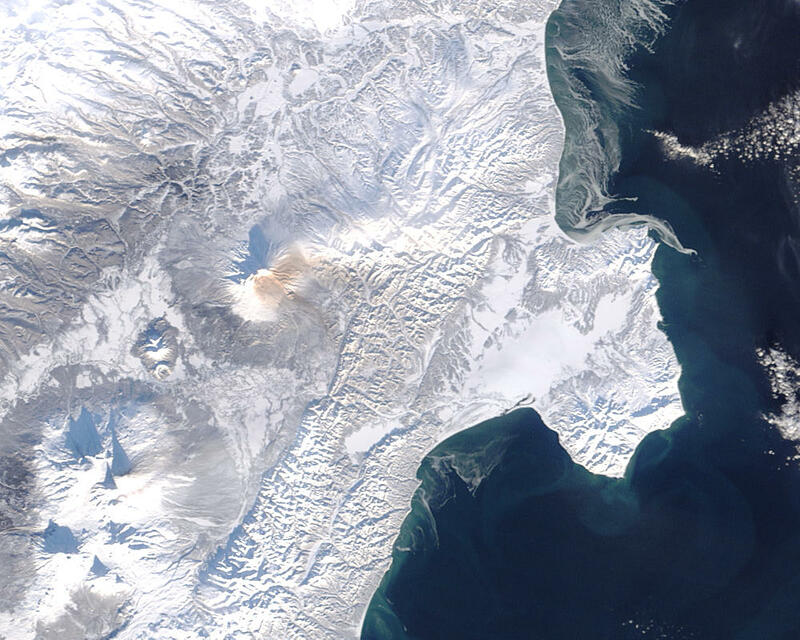 Shiveluch’s ash plume is visible in this true-color Moderate Resolution Imaging Spectroradiometer (MODIS) image. Brown ash from the eruption taints the snow around the volcano. Klyuchevskaya, below Shiveluch and to the left, has a thin, barely-visible plume of ash flowing east from its top. The Terra satellite acquired this image on January 12, 2004.